Flexible and efficient workpiece handling. JumboFlex, the new vacuum tube lifter, is ideal for the frequent and very rapid movement of lighter workpieces with weights of up to 35 kg. Depending on the nature of the workpiece to be transported, the vacuum tube lifters can be fitted with various suction pads, such as individual, sack, double or special suction pads. This allows for optimal, safe and precise transportation of each workpiece. Used in combination with a MILLSOM easy-to-move slewing crane or gantry crane system, this new addition to the Schmalz product range delivers a perfect handling solution with ergonomic and simple single-handed operation. 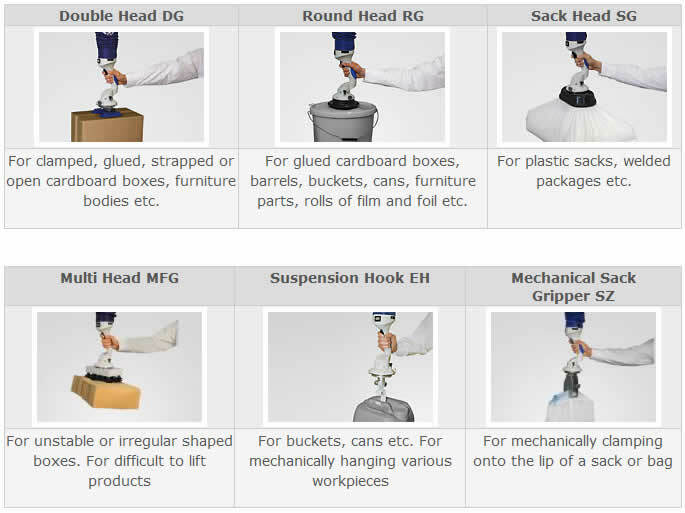 A range of vacuum heads are available to enable the customisation of the complete system to best suit the application. The JumboFlex control unit has an integrated quick-change mechanism that enables fast and simple head changes.